At first glance, Emaline seems to have it all. A great boyfriend, a close-knot family, an idyllic beach town to call home. But now, in the summer before college, Emaline wonders if perfect is good enough. Then she meets Theo, an ambitious young New Yorker assisting on a documentary film about a reclusive local artist. He's sophisticated and exciting, and thinks Emaline is destined for bigger things. 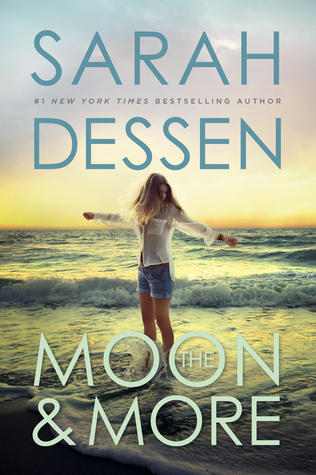 This week for my Sarah Dessen Readathon I read The Moon and More, which is another book that I’ve read before, but also really enjoyed, and couldn’t wait to read again. I remember really enjoying this book the first time I read it, but I feel like I enjoyed it even more the second time around! Like many of Sarah’s other novels, I really, really loved so many characters in this book. I always find myself forming these emotional attachments to them, and the main character in this story, Emaline, was no exception. I related to her in so many ways. And it wasn’t just her; I loved a lot of the secondary characters as well. She had a really awesome family, and I think I love that more than anything. The only thing about this book that differs from the others is that I didn’t care of either love interest in the story. That rarely happens, but it did in this book. The thing I remember most from reading this book before was the ending. It was one that I didn’t see coming the first time I read it, but I ended up really loving it, and the decision that Emaline made for her future. I also absolutely love that this book was set during the summer, AND at the beach. I am usually not a fan of summertime at all, but I’m actually really enjoying it this year, and I think all of the summer books that I am reading definitely have something to do with that. And the beach setting has me super excited for my beach vacation coming soon. All of this makes the storyline and setting for this book even more special to me, and I totally find myself wanting to visit Colby! Overall; I’ve read The Moon and More before, but I really forgot how much I enjoyed the book the first time, and I think I enjoyed it even more reading it for the second time. Next on my list is Saint Anything, another re-read for me, and the LAST book on my readathon list before I can finally start Once and For All!